Many people often ask us, what camera do we use on our travels to capture the photos shown on this blog. These days, many people use their phone cameras to capture their photos, and for the most part the quality of photos taken by Iphones and many Android phones are good. But their quality will never compare to a true camera, especially in situation of low light or difficult lighting conditions, such as when the sun is behind the person. Phone cameras will typically capture the photo, but you cannot see the person due to the bright back light such as the sun or bright sky. A dedicated camera will always be better for photos and that is what we recommend. In photography, cameras with bigger sensors will produce sharper, clearer images, with less noise than cameras with small sensors. This is why SLRs typically produce higher quality images, because they utilize what is called an APS-C sensor. This sensor is literally much bigger physically than sensors found in small point and shoot and phone cameras. For many people, they believe that the “bigger the camera”, the better. This is not always the case. I see many people with large digital SLRs cameras, expecting high quality photos with the perfect lighting, but end up getting results that doesn’t meet their expectations. The truth is, SLRs can produce the best photos, but only if you know how to use it well and understand all the settings. Another drawback is the large size of SLR cameras, they are large, heavy and cannot be used in one hand. For the average person or traveler, I recommend Mirrorless cameras. Mirrorless cameras are much smaller than SLRs, but some of them have the same large sensor size as SLR cameras. This means you get a camera that has almost the same image quality and speed of an SLR, but at a much smaller size to carry around. They also are more “user friendly” by including smart features that helps automatically adjust settings based on the lighting condition. This helps the average user who might not want to mess around with the settings too much and makes everything easier. Sony Mirrorless cameras has been the rave the past few years, with many professional photographers praising them for their high image quality in a small size package. This is what we recommend. Our travel/everyday use camera is the Sony a5100 with 16-50mm Kit lens ($550 for Camera + kit lens). This camera is small, lightweight (you can hold it with one hand), and takes great photos. It is one of the smallest and lightest mirrorless camera out today. The lens also retract, so when you turn it off, it is smaller in size and can fit in a case. It is a “smart” camera, in which it will automatically adjust settings for you depending on what you are trying to take. We use the default green “auto” mode which works great. For example, when you take a photo of a person with a bright sun in the background, normally the person’s face will be dark. With this camera it automatically brightens up the face of the person. It takes photo at 23 MP and can also record 1080p video. With this camera, you don’t have to worry about changing settings (although you still can), as the camera will do it for you. I owned a few SLRs before, and ended up not using any of them anymore now that I have my Sony a5100 camera. Another cool feature is the built-in Wifi on the camera. The camera can connect and send photos wirelessly to your phone. So you can take the photo on the camera, and have it transferred directly to your phone for posting up on Facebook or Instragram. This makes it easy for those that tend to take photos on their phone just so they can immediately share it. For the price, the camera is a good deal compared to other similar cameras. Compared to other more expensive cameras, you get a lot of bang for your buck with this model. See this post here for photos taken with this camera. Note that, to get photos to look more vivid and strong colors, you will need to use Adobe Lightroom to enhance the photos, or you can also use the in camera “Creative Styles” to get stronger color effects. I will cover this in a future blog post. Either way, the photos taken by this camera are good. The camera itself is quite small, a bit bigger than a normal point and shoot. 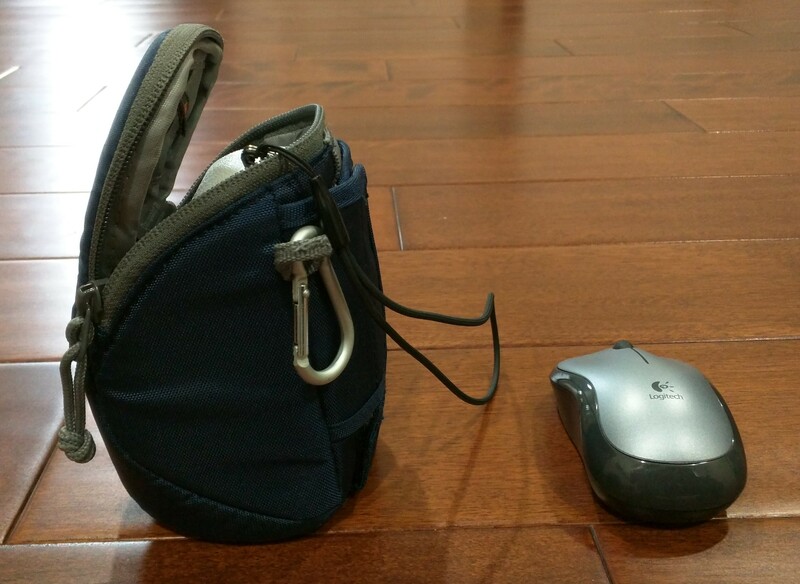 Here it is next to a mouse for size comparison. Below are the links to the Sony a5100 that you can purchase from Amazon, along with a recommended memory card and case for it. If you have any questions, please feel free to comment below or reach out to us. All the travel photos on this blog is taken with this camera.